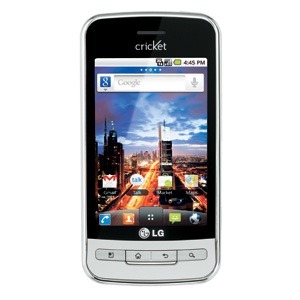 While Cricket may not be the first (or second... or third...) US carrier you would normally consider signing up with, they have a deal on a variant of the LG Optimus One that certainly caught our attention. The LG Optimus C (we are guessing that C is for Cricket) is being sold off-contract for a mere $130 (after a $20 web discount and $50 mail-in rebate). So while it won't exactly replace your Thunderbolt or Atrix, the solid and affordable smartphone from LG can be bought without a contract for less than most high-end phones sell on-contract. The design changes will be extremely minor from the Optimus One, and it sports the expected capacitive 3.2-inch HVGA display, 600MHz processor, and Froyo out of the box. If you have ever seen their stores but never bothered to find out more, Cricket is the seventh largest wireless provider in the US, offering flat-rate budget-minded plans that don't require credit checks. They have a roaming agreement with Sprint and MetroPCS, so your coverage with them may be better than you would originally expect. The phone may not necessarily be available in your market though. I searched for it in Chicago and was told "Sorry, this phone is not available in your market" (that seems odd for one of the biggest cities in the US, which has Cricket stores all over the place). You can head over to Cricket if you want to check for availability in your area and to find out more about this interesting offer. The LG Optimus 3D Will Be Known As The LG Thrill 4G - Launching On AT&T "In The Coming Months"